Superhero stories have some trends we like to take for granted. You know, little elements that crop up again and again. Kid sidekicks, animal pals, family units—you get the idea. They’re the sort of things that just happen in superhero comics because they're superhero comics, right? But what if I told you we can actually trace some of those trends back to their origins? Okay, maybe in this era of wikis and comic book journalism, that’s not very surprising. But what if I told you most, if not all of them, actually came from one very specific group of characters? The Shazam family has a pretty bizarre history by all accounts. While many of the heroes you find in the pages of DC comic books these days are brand new to the DC Universe, Billy Batson and his alter ego most certainly are not, and his stories provided the foundation for more than you might expect in the modern DCU. Here are four major Shazam Family firsts that went on to influence the way we understand and consume superhero stories to this day. Surprise! You know how everyone knows and loves the Bat-Family? (Heck, I even write a column entirely devoted to them.) They’d likely be nowhere to be found without the Shazam Family paving the way. They may have been called the Marvel Family way back in the 1940s, but Billy and Co. were the first ever family unit of superheroes to be published in comics. They even had their very own Marvel Family ongoing series for a while there. The original extended Shazam family was made up of Freddy Freeman as Captain Marvel Jr, Mary Batson as Mary Marvel, and three other Billy Batsons, as the Lieutenant Marvels (don't ask). It even eventually went on to include Billy's "Uncle" Dudley, who wasn't actually his uncle, as "Uncle Marvel." Their legacy lives on in the modern era with the new Shazam Family: Freddy, Mary, Pedro, Eugene and Darla. Superpowered pets are another quirk of comics. You know Krypto the Superdog? Streaky the Cat? Ace the Bat Hound? They owe their existence to the Shazam Family. Not only did Billy have a walking, talking anthropomorphic tiger, Tawky Tawny, as a pal, there was Hoppy the Marvel Bunny, a super-powered rabbit. The trend was popular enough to even earn its own ongoing "funny animals" spin-off comic during the ’50s. People in the ’50s really loved animals in costumes, apparently. And who could blame them? It may seem absolutely crazy to think about now, but Billy Batson was actually the first ever superhero to be given his own live action film. No, really. All the way back in 1941, just one year after Billy officially debuted, the live action serialized movie Adventures of Captain Marvel ran for twelve whole chapters. Of course, Adventures of Captain Marvel is really nothing that even resembles the superhero movies we know and love today, but it was the first time anyone even dared think that these funny books could have a life outside of the printed page. So, when you're sitting and watching Billy and Shazam on a massive, high definition screen this weekend, think back to the flickering black and white adventure people would have crowded into theaters to see almost eighty years ago. Surprise! Billy's arch-nemesis, Dr. Sivana, actually pre-dates the likes of both Lex Luthor and the Joker by a matter of months. Sivana's first appearance was in Whiz Comics #2, which hit shelves late in 1939 while both Lex and Joker wouldn't show up until mid-year in 1940. Sorry, boys, but Sivana's got an advantage in this one, and he helped provide the layout that countless super villains would follow. Chances are, if there's a mad scientist fighting a masked vigilante on the page or on the screen, that scientist owes a little something to the one and only Dr. Sivana. 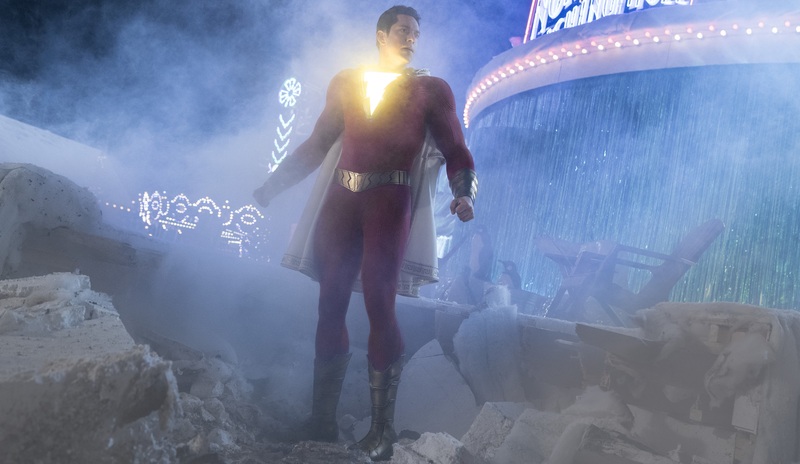 Shazam!, starring Zachary Levi, Asher Angel and Mark Strong, arrives in theaters Friday. To discover more about DC's latest movie, click here. Meg Downey covers movies, TV and comics for DCComics.com, and writes two monthly columns for the site, "Gotham Gazette" and "Relationship Roundup." You can follow her on Twitter at @rustypolished.